AleaSoft, September 13, 2018. 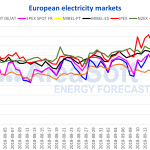 During this week the high prices continue in the main European electricity markets and in some cases the records registered on the first week of September have been surpassed. AleaSoft considers that this streak of high prices is mainly due to the continuous increases in the CO2 emission rights market and also to the high prices of fuels used for power generation. Last week we commented that September had started reaching record prices in the main European electricity markets and this streak continues in the second week of this month when several of these records have been broken again. According to AleaSoft analysis, in the MIBEL market for Spain and Portugal on September 12 several records were broken: the price for the 21st hour, 80.08 €/MWh, is the highest hourly value of this year, and also the highest for a September of the last decade; furthermore, the average price of that day, 75.39 €/MWh, is the highest of the year and for a September of the last ten years. The seven highest daily price values of this year have been registered in September, and the 21 highest values between August and September. In the EPEX SPOT France and Germany/Austria markets, the average price of September 13 is the highest for a September of the last decade. The price of that day in the French market was 71.10 €/MWh and in the Phelix market 71.52 €/MWh. In the last seven days the price in the Italian market IPEX has risen almost 10 €/MWh compared to the previous week, reaching 91.26 €/MWh on September 13. During this week the N2EX UK market prices have risen more than 2 €/MWh compared to the previous seven days, while in the Nord Pool market, after the record values reached last week, prices have fallen more than 4 €/MWh this week. Electricity futures markets have also increased prices compared to last week. In the OMIP market, the Spanish electricity futures for Q4-2018 have risen more than 3 €/MWh compared to last week; the highest value of this product was negotiated in the session of September 11 and reached 62.58 €/MWh; that day, the price of the year 2019 also reached its highest value so far: 64.40 €/MWh. The German and French electricity futures in the EEX market also rose between 3 and 6 €/MWh during this week. Aleasoft considers that this situation of generalized high prices is mainly due to the continuous increases in the CO2 emission rights market and the high prices of fuels used in electricity generation. This week the CO2 emissions rights market (EUA) has been characterized by high prices: on September 10, the futures for December this year were quoted at 25.24 €/t. The prices of Brent and European gas have also risen this week; in the case of Brent, the futures for November closed at 79.74 $/bbl. On the other hand, the European API 2 coal futures price for September has dropped after the maximum of 101.98 $/t reached on September 5. 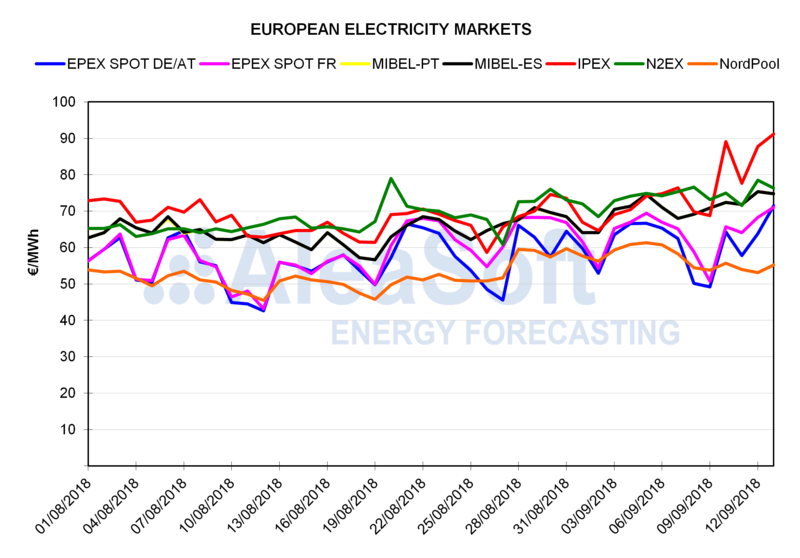 According to AleaSoft’s forecasts, the price in the MIBEL daily market of Spain and Portugal will continue above 70 €/MWh next week.